Our CHEEZ WHIZ Pasta Toss has only 4 ingredients, but it's big on flavour. Toss hot cooked pasta with peas, ham and CHEEZ WHIZ for a simple and satisfying entrée. Cook pasta in boiling salted water as directed on package, adding the peas to the cooking water for the last 2 min. of the pasta cooking time. Drain. Meanwhile, microwave ham and Cheez Whiz in large microwaveable bowl on MEDIUM 2 min. or until hot, stirring after 1 min. 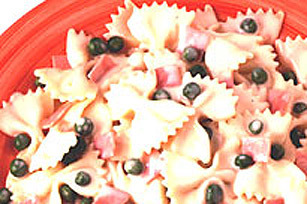 Add pasta and peas to ham mixture; mix lightly. Sprinkle with chopped green onions just before serving. Substitute fresh peas for the frozen peas and add them to the cooking water for the last 5 min. of the pasta cooking time. Prepare as directed, using a frozen mixed blend of peppers, mushrooms and onions instead of the frozen peas.